The ancient glory of enamel left us with exquisite masterpieces made by various techniques. While the popularity and diversity of enamelware in today’s market has declined compared to their golden days, a look into enamel’s history, techniques, aesthetics and revival reveals valuable details about this unique craft. Above the hustle bustle of Hanoi’s busiest district, I retreated to a quiet corner inside the then-up-and-coming Cong cafe. I just returned to Vietnam after four years living in the US, surprised to find Starbucks has not touched such a country with a strong coffee-drinking culture. Instead, a local cafe chain with a post-war subsidy economy theme quickly won the hearts of the youth. At the counter on the first floor, greeted by young, friendly, well-trained employees in war-time uniforms, I paid 45,000VND (about $2) for a standard hot black Vietnamese coffee – a price too high for a developing country who ranks in the top 5 coffee-producers in the world – then mounted upstairs and found for myself a scarred vintage wooden table, flanked by colonial style curved wood armchair covered in red vintage fabric, the type my parents received as a gift for their wedding in the 1980s and is now spending the rest of its life at the bottom of the closet due to the invasion of modern, trendy Korean beddings. As I started to lose sense of time amid a strangely familiar atmosphere that the shabby interiors evoked, a waitress brought me my coffee, served in a set of enameled cup and saucer. I have not seen them since the old days spending the summer at my grandparents in their tiny house, eating my grandmother’s lunch while listening to her reminiscing about the time of scarcity, of war and reconstruction. The enamelwares are now in a storage somewhere, no longer used, no longer in trend. But the set in front of me at Cong cafe is no old and cracking enamelware from a time of war and living by with aids from richer allies. This is new, good quality enamelware designed to evoke a sense of nostalgia from a generation born and raised as the country transitioned from an era of an-no-mac-am (a newly opened country where the people struggle to satisfy the basic needs – feed their mouth and keep themselves warm) to an-ngon-mac-dep (a country that has enough excess so that their people move on to the next level of needs). From that point on, enamelware came back into my radar. The history of enameling runs older and deeper than my own history with it. The technique, whose fundamental is fusing a glass-mix powder onto a surface through firing, has been omnipresent since the golden days of ancient Mediterranean civilization. It is still not clear who invented the specific technique; but one can find traces of this technique on artifacts scattered from Europe to Asia and North Africa. While modern enamelware makes me think of metal – tin, cast iron or steel base – enameling can be done on glass, ceramics, stone, and more precious metal such as gold and silver – as long as the base material does not deform during the firing-to-fuse process (which usually goes up to 850C). The result is a smooth and glassy, heat and scratch resistant, colorfast and chemical safe coat not only to protect but also to add value to the original surface. The range of enameled subjects also varies – from small sized jewelries to large boxes and panels (paintings, car parts, sculptures), from everyday homeware to precious, sometimes religious artifacts, from flat surfaces to 3D objects. There existed in history many different techniques of enameling, each had its own pros and cons, rise and fall. If you have time, read on. If not, you can skip to the next part – Modern Enamel. Basse-taille: the edge of the design (low relief) is carved onto the surface then covered with translucent enamel. The light reflecting from the low relief create an artistic effect on the final design. This is one of the oldest and most basic techniques of enameling, yet in decline in today’s market. Champleve: the design is carved, etched or cast onto the surface then filled with enamel. After firing and fusing, the enamel-coated design will appear in the lower relief while the raised background is left exposed. The Limoges area in France is famous for this technique, although they may not be known for producing the highest quality. Cloisonne: probably one of the most popular enameling techniques. To create the design, thin wire is attached to the surface to form raised barriers around cells (cloison in French). The cells will then be filled with enamel and the wire will be kept in the final design. The thickness of the wire differs depending on regions and periods in history. There are two main types of Cloisonne: full and sunk. In full cloisonne, the design is backed by a layer of gold foil that curves at the edge to form the cells. Wire will be added along such curved edges and enamel filled inside. In the sunk technique, the patterned area is hammered down then wire is added to the rim. 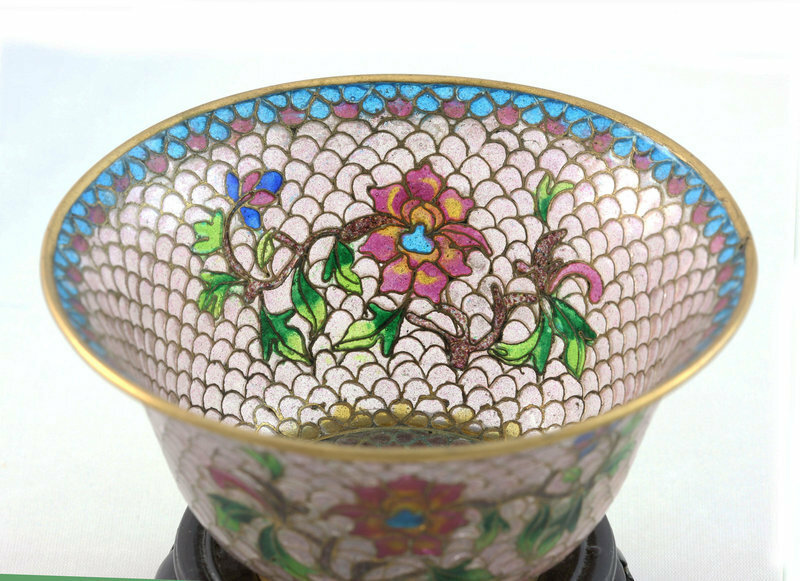 Enamel fills the inside, in a typical cloisonne fashion. Sometimes, especially in Russian cloisonne, the bordering wire is twisted or braided to create a design itself. Deriving from the basis of cloisonne, plique-a-jour (means open to daylight in French) reaches a more refined, yet harder to achieve appearance. Plique-a-jour follows the same principle of filling cells with frit but the backing material is removed after the firing, leaving only a shell of enamel, giving the final product a similar look as stained glass. In Western plique-a-jour, the gold foil backing the cell (as in full Cloisonne above) remains while in Japanese shotai shippo, such cell is etched away in the end, leaving only the fused glass layer. This makes some of the most elegant and surreal enamel pieces I have ever seen, and the delicate appearance is completely different from the rustic, bulky, solid colored, metallic aesthetics that my mind usually associated with enamel. En resille is another delicate form of enameling that carries a glass rather than metal appearance. The design is etched onto glass, then lined with gold foil and the hollow part filled with enamel – in a similar fashion as Champleve. The final design looks as if it is suspended in clear glass. This technique is time consuming and hard to achieve because one has to be careful to not break the glass during the firing/fusing process. An American artist in the 60-70s called Margret Craver revived this lost art but, given the dexterity of the technique, en resille is never meant for the mainstream. Fine jewelry by Margret Craver, the artist who brought en resille back into the design scene in the early 20th century. Sgraffito also relies on etching but not necessarily onto the base material. Instead, a layer of enamel is fused then covered by a second layer in different color. The design will then be etched away from this second layer, leaving negative area in the ground coat color. There are also techniques that may not require any form of etching or scratching – those are called painted enamel. Due to its ease of production, painted enamel survives until today and is omnipresent in everyday objects. Colored frit can come in the form of liquid or gel, making it possible to simply paint it on a surface. Deriving from this technique, we have Grisaille, in which dark colors (often blue and grey) is applied first, then layer after layer of translucent enamel is applied on top, resulting in a monochrome final design. This technique is suitable for large objects, stained glass pieces, paintings and sculptures. Stenciling, as the name suggests, involves placing a perforated design atop the piece, then enamel is applied; the stencil is removed before firing. Serigraph, on the other hand, employs a silkscreen. Ronde bosse (in the ground in French) is a form of enamel in which a figure or the bordering wire of a design on a flat surface is covered in enamel, resulting a 3D enamel finish. This technique is employed to cover a part of the base metal – often precious – while certain areas is left exposed.The play of enamel-raw materials on a sculptural form can be interesting. From an art reserved exclusively for jewelries and valuable items, in the 19th century, enameling became popular again as a technique to coat kitchenware – pots and pans, tablewares, utensils, coffee-ware. The US and European enamelware industry ran parallel during this period. At the turn of the 20th century, enamelware manufacturers in the US entered their golden days with three leading companies producing three patented mottled enamel designs with similar appearance – graniteware (by St. Louis Stamping Co.), speckle ware (by Vollrath Company) and agate nickel-steel ware (by Lalance and Grosjean). By 1950s, all of them experienced a decline in sales which resulted in either bankruptcy or changing of direction towards other product lines. From early 20th century leading to the 1950s, enamelware resurrected in Europe, first with the rise of Art Deco. Le Creuset: a French manufacturer and exporter of enameled cast-iron ware, distinguished by popping exterior colors (the most famous one is orange). Le Creset has always been a French staple; an investment that will last a lifetime. In fact, my French husband lives true to his heritage and has several cast-iron pots in his kitchen in New York. They speak quality – heavy, durable, and keeps getting more beautiful as they age. Le Creuset enameled cookwares are not only staples in a French kitchen but a must-have for lovers of quality, grandma-inspired cooking and anything slow-food. While renowned for primary colors, Le Creuset also launched a matte collection to stay in touch with contemporary trend. Wärtsilä and Järvenpää Emali: a Finish company that owned the iconic bold colored and bold patterned Finel enamel brand. Antique Finel product lines show primary colors and bold, now-iconic patterns. Falcon: probably the most prominent manufacturer of British style blue-and-white enamelware. Cathrineholm: the Norwegian studio whose lotus enamel line is among the most well-known in mid-century modern period. Cathrineholm illustration by Libby VanderPloeg. Lotus patterned pan by Cathrineholm. Although production stopped in the 60s, those antique Cathrineholm enamelwares are much sought-after today. Krenit: a Copenhagen based enamel brand made famous by Herbert Krenchel’s glossy, solid colored interior and matte black exterior bowl-salad server pairs, currently re-issued by Normann Copenhagen. Alex Drake Vintage ran an informative comparison between Krenit and Cathrineholm for interested collector (and curious newbie like me). Kobenstyle: the fruit of collaboration between two American entrepreneurs and Danish designer Jens Quistgaard, the limited yet iconic designs in the Dansk Kobenstyle range are now owned and distrinuted by Lenox, retailed in the US by shops including Macy’s, Anthropologie and Crate & Barrel. A set of vintage yellow Dansk Kobenstyle, sold (out) for $275 by Finder Not Keeper. Dansk Kobenstyle is now distributed by Lenox. That glory was, however, short-lived. Most of the aforementioned mid-century enamel designs now became either collector’s pieces or overpriced products relaunched by modern mass production brands. To go back to my melancholic encounter with enamel in Hanoi, I thank the occasion for sparking my interest in an art that would otherwise slip into history’s inevitable rise-and-fall cycle. More than once, I hesitated buying their mugs, which I believe are sold for a higher price than their true worth. Maybe it’s just me, I hesitate to buy any kitchenware that does not go in the microwave (I have a bad habit of leaving my coffee cold before finishing it). The pattern design on Cong cafe’s lines is far from matching with the iconic mid-century modern designs, even further from the intricate enamel artworks made earlier in history. If anything, it evokes in me a long gone childhood, something old enough to make me stop and indulge in a moment of nostalgia, although I could barely decide from what point in history my nostalgia directed at. I guess I am not the only person to embrace enamel, first and foremost for this quality. Until a flock of designers comes in and start another chapter in this long story, enamel today is not more than a longing for what’s by-gone.